The horseman has a special place in Australian history and culture. 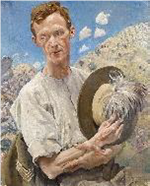 The most famous example is Andrew Barton ‘Banjo’ Paterson. Banjo Paterson’s Clancy of the Overflow and The Man from Snowy River are the most well-known and beloved odes to the horseman in Australian history. The romance associated with the figure of the horseman carried over to Australia’s military forces. The colonial militia unit, the New South Wales Lancers, trained with actual lances and wore the famous slouch hat with an emu plume. The Light Horse carried on this tradition in the First World War, cutting a dashing figure. The Light Horseman was also lionised in words and art. One of the official historians of Australia in the First World War, Henry Sommer Gullett, wrote: “so far as a distinctive type has been evolved it is…. young men long of limb and feature, spare of flesh, easy and almost tired in bearing… the Light Horseman for all his unconventional ways…. was at least distinguished by shyness and reserve. The young countryman leads a simple and peaceful life. He bears himself modestly… A felt slouch hat, a shirt with sleeves rolled to the elbows, long trousers. (H.S. Gullett, The Australian Imperial Force in Sinai and Palestine: 1914-1918, Angus & Robertson, Sydney, 1936 (3rd edition), p.34-6). The official Australian war artist of the First World War, George Washington Lambert, became famous for his depictions of the Light Horse, including the charge of the Light Horse at Beersheba, creating some of the most iconic art of Australia’s involvement in the war. The horse was prized by stockmen, the military, explorers and even bushrangers, as it could withstand the hot and dry conditions of the Australian Bush. It was especially ideal as a cavalry horse and Walers were exported from the 1830s, including to the British Indian Army. They were used in the Second South Africa (Boer) War from 1899-1902. The Waler was most famously used during the First World War, with nearly 40,000 used by the Light Horse in the Sinai and Palestine Campaign. Only one Waler was returned to Australia after the war, ostensibly because of the quarantine restrictions, but also because the cost of return was expensive. The Waler continues to exist in Australia today. A sergeant of the Light Horse by George Washington Lambert (Image courtesy of the National Gallery of Victoria).